Shaking up the traditional matched dining set is a great way to personalize your dining room, but it does take some finesse to get it right. 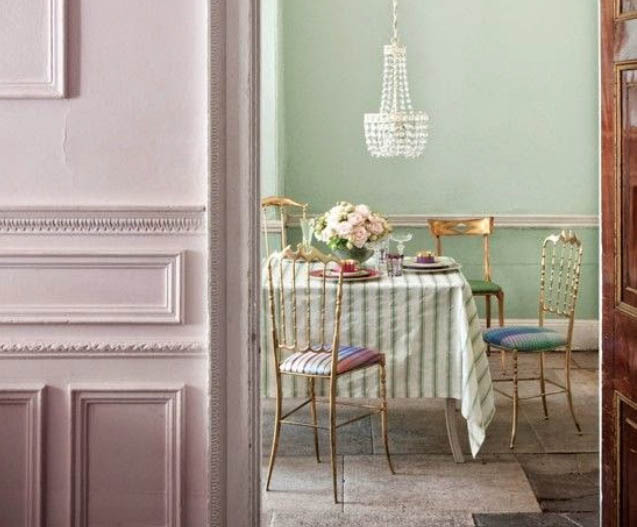 Here are some dining chair combinations that strike the right balance between eclectic and pulled together. Whether your dining area is formal or casual, modern or traditional, elegant or eclectic, one thing is true, you will need dining chairs. While it’s easy to fall back on the already-put-together table and chair sets, consider thinking differently by mixing styles. Who made the rule that a matchy match dining room set is the only way to put together a table and some chairs? Why do so many of us feel the need to follow this unwritten tradition in the dining room? I say let’s mix it up in those eating rooms already! And if a matching dining set is more in your comfort zone, there are still things you can do to make the most of your space. 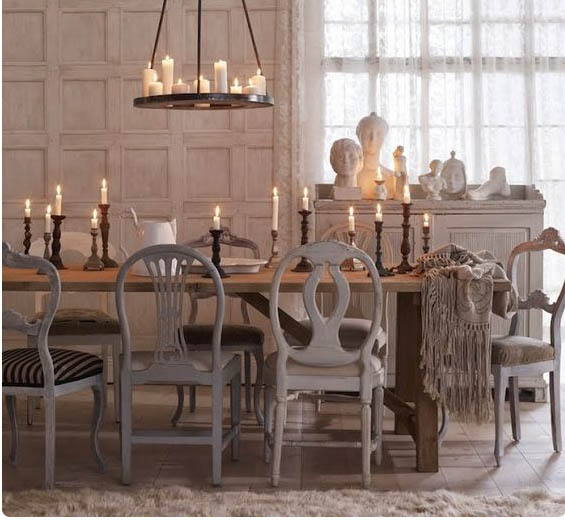 Whatever you choose, hopefully this blog story will help with inspiration when your ready to re-think your dining room style. Let’s try to find a space with the perfect chairs, a distinct personality and a vibe all your own! This totally spectacular image implies that the concept can be used in formal spaces, too! 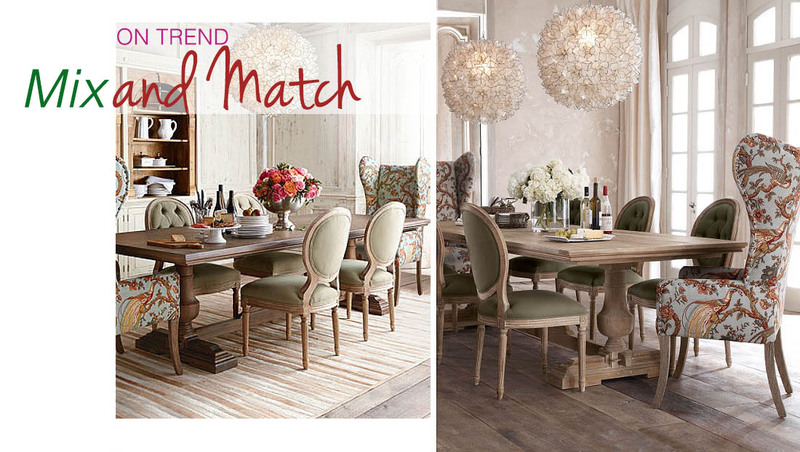 I found some photos that show how people are choosing to mix up styles for their dining areas. Sometimes they use large upholstered wingback chairs at the ends of the tables, sometimes there is a bench or a sofa on one side of the table, many times it the same chair with different colored upholstery for the seats. 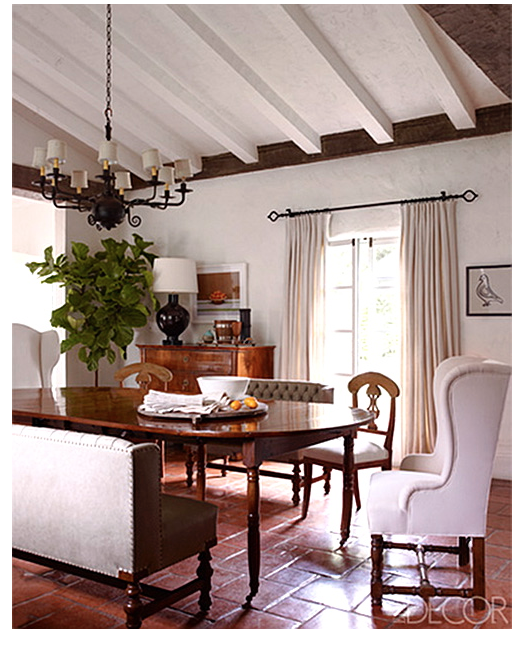 Seeing Reese Witherspoon’s Ojai dining room featured in the latest issue of Elle Decor got me to thinking of the mismatched dining chair trend. I think the look works here because Witherspoon’s home is very casual and eclectic. To keep it simple, let’s take a look at several wood tables coordinated with different chair types. We’re breaking all the rules in the dining room today. C’mon, let’s go! The mismatched chairs trend has been around for quite a time now. It’s found in all types of homes, and apartments. It’s been done in every way and budget. Everything from flea market finds that can be re-fashioned ~ to high end styling and most design pros embrace it. And why not? It is totally awesome, and can be very sophisticated and can be adjusted to match all sorts of styles. Same color, different style. The most noticeable common thread here is the similar color of the fabric and wood tones. The mismatched chairs in this room have been reupholstered in the same fabric and kept within the general style (traditional/modern) to create that common linking element. 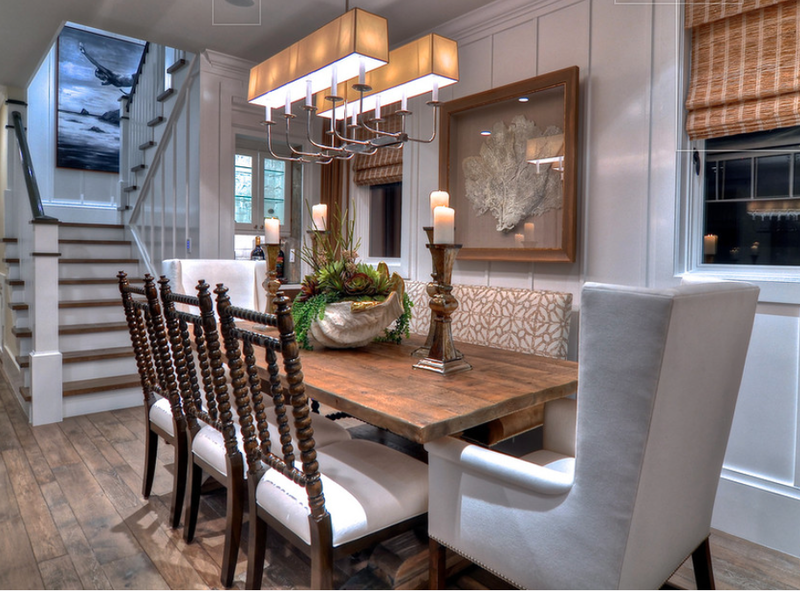 The accessories pull the wood tones and textures across the room creating a charming effect. If you are browsing all the beautiful furniture brands and all the lovely collections they offer….you may be surprised to find that there are many styles of chairs to choose from within one dining collection that “shakes up your options” and will suit the personality of your home. This is a dining trend that designers and manufacturers are aware of and yes, they want to help ease your way. If you’re tired of your old dining chairs but don’t want to splurge on replacing the entire set, replace the two that sit at either end for a polished-yet-eclectic vibe. Even just 2 chairs can make for a new beginning! Grandma’s dining set probably matched, but modern homeowners, want to use the dining room for everyday use. Fortunately, furniture and decorating trends have moved in the same direction, bringing the once little-used room back into the mainstream of daily living. This change is one that has been happening for years. Trends continue to make the dining less formal and much more livable and family friendly. Celebrate style diversity with mixed styles and same gold finishing paint. You can take some mismatched chairs and use the same fabric or paint same color to tie them together. The grey chairs with contrasting warm gold table top creates some serious drama. The key to obtaining this “mismatched” look is that there has to be a common thread that links the mismatched items together. It could be a common style, wood choice, wood color, upholstery fabric. To properly pull off this look, there are a few guidelines to keep in mind. the tips below will get you started on your way to create this unique and fun look! If you’re up for a little DIY project, you can make your dining chairs either similar or different by changing the upholstery on the seat. You can take a matching set and make each seat different, or you can take some mismatched chairs and use the same fabric to tie them together.